That's a mouthful! And the pasta was too. Bite after bite of warm, comforting, creamy, savory, fall-is-here pasta. This pasta is gluten-free, soy-free, and also largely effort-free! Ok, not entirely, but if you first make up a batch of my Cashew Cheese, you can pull this pasta together in a snap. You can refrigerate - or even freeze - portions of the cashew cheese, so it's really worth doing, folks. I do just that regularly, and then have this luscious, tangy, cheese waiting for spreading on whole-grain breads, to use on pizzas, for raw dishes, or for pasta. First note: Rather than make the 'truffled' version of cashew cheese, instead go with the herbaceous option (in note of recipe). And yes, I just like saying herbaceous. :) I often skip the truffle oil and instead add fresh rosemary, fresh oregano, fresh thyme... a little of each, just playing by ear. Taste as you go, and see if you want more, or if you'd like fresh basil, or parsley - your call! So, I had this cashew cheese sitting in my freezer. Some butternut squash in the garage, chilling out. I saw a blip of Giada De Laurentiis making this creamy butternut squash pasta, where she was using goat cheese. No thanks, Giada, but I do appreciate the moment of inspiration! Without looking further into her recipe, I got to business. Then, get yourself a medium-large onion (I used red, but white is fine too), and also cut into chunks - a little largish, as it will roast quicker than the squash. Pop both the squash and onion on a baking sheet lined with parchment, and toss with the olive oil and dried rosemary (measurements/recipe to follow). Bake up! Nice and caramelized, yummy smelling house, we're there folks! Now, cook up your pasta, I used Trader Joe's brown rice penne, but you can use whatever you like. Once cooked to where YOU like it (I'm not on board with al dente, not everyone likes their pasta al dente and there's not really any such state with brown rice pasta, in my opinion... so cook to the consistency YOU like - it's your food people)! Drain pasta, but it doesn't have to be bone dry, better it be a little wet so the cheese/sauce will meld with the pasta. Now, add your cashew cheese and non-dairy milk, stir through gently until the cheese is softening. Then add the squash, onions, toasted pecans (reserve a little for garnishing after), and fresh oregano. (Note: Depending on how much pasta you have used, you may need extra cheese/milk, work to taste, and season to taste, as you may also want extra salt/pepper.) And, if you have fresh chives, this would be a nice addition too - I didn't, but it would make a lovely finish. Also give lemon wedges for serving, a squeeze of fresh lemon juice heightens the flavors. Now eat. Enjoy the bites of sweet caramelized onions and squash with the hits of savory oregano and nutty pecans in the creamy, slightly tangy cheese sauce. Preheat oven to 450. Place squash, onions on baking sheet lined with parchment. Toss with the oo, rosemary, s&p, and roast up for 35-45 minutes until caramelized. Toast pecans (can toast on a smaller pan at same time in oven or in toaster oven, just check frequently, between 6-10 mins, until aromatic and golden brown; can burn quickly so keep a watchful eye). Meanwhile, get pasta water going, bringing to boil, and then adding pasta (this can be done last 10 mins or so of baking, or later, as the squash can be roasted in advance). Once pasta is ready, drain, toss with cashew cheese, milk, salt (start with 1/4 tsp at first) roasted veg, pecans, oregano. Adjust milk/cheese, and salt to taste, then serve and finish with extra pecan sprinkling and lemon squeezies! I've been doing weight watchers online and I saw a non-vegan version of this recipe on their site! I was just thinking about how to vegan-ize it, now I can just try your version!! Butternut squash is gorgeous, I agree. 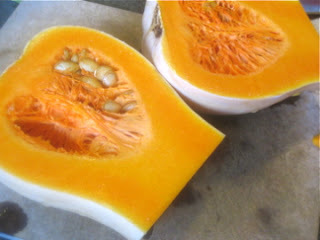 All winter squashes are, but the intense color of butternut gets me every time! Wow, that pasta dish looks seriously delicious. I need to make it soon! Dreena! Your awesomeness knows no bounds. This is exactly what I want in my belly RIGHT NOW! oh, and hopefully the butternut squash didn't give you too hard a time - I agree, not the most fun to chop, but once you get rid of the rind it's not so bad!